A YEAR ON, I am very much still in Accra. It’s been ONE YEAR already? Next, I’m expected to say, “Time flies”… but NOooo, time does NOT fly; in fact, time here seems to stall; and so are the persisting problems. An unresponsive landlord… “land” WHO? The unfortunate flooding of the office! It’s been a year; it felt like five; I’ve aged ten years. I wished time flew and blew away all those problems along too. 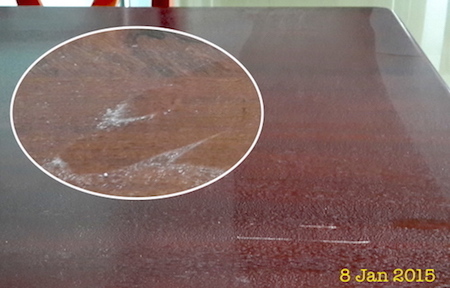 Harmattan headache… this layer of dust appeared barely 30 minutes after wiping the table. Throughout Dec to Jan, we were overpowered by the northeasterly dusty wind that blows annually from the Sahara Desert towards West Africa. The office flooded after continuous rain overnight! But to think I almost didn’t live to tell my tales, considering most recently this month I was almost electrocuted by a faulty wiring at home in the latest series of misfortunes. 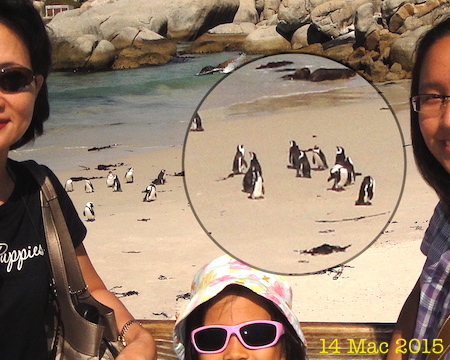 22 Sept 2015 could have marked my end! 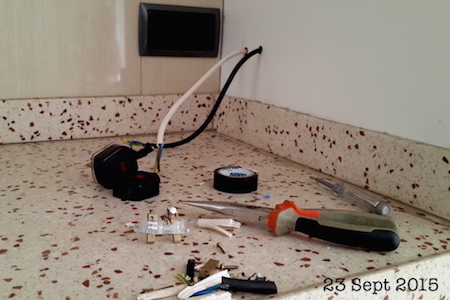 The oven wiring was repaired the next day, which is commendably quick response, considering a handful of defects are still waiting to be attended to after a whole year; while one defect took six months to rectify and it still didn’t function! On a more positive note, in that past year too, we’ve taken a little time to explore what we could, including Cape Coast Castle and Kakum National Park in the Central Region. 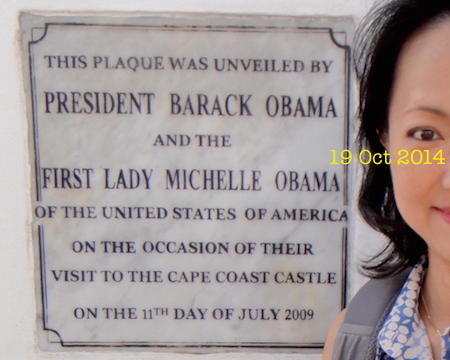 At the Cape Coast Castle, we walked on the same path as the African slaves did more than three centuries ago (and President Obama and the first family in 2009), except unlike them, we had a point of return. 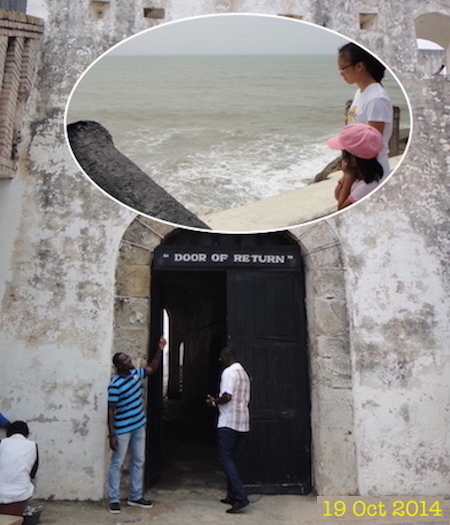 It is tragic to think that slaves walked out of that door and never got to return home; many even died in the sea. The girls on the canopy walkway. 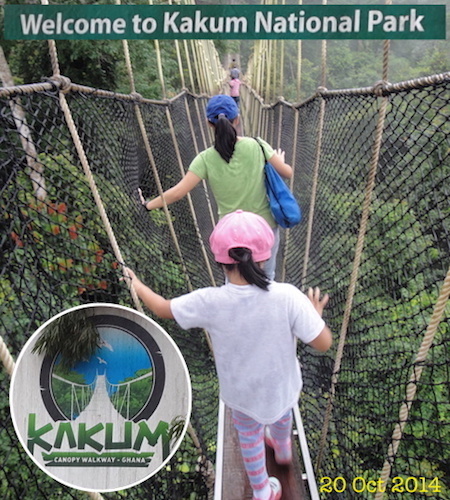 We have a number of similar canopy walks back home including at the Forest research Institute of Malaysia (FRIM), Selangor and most recent the KL Forest Eco Park Canopy Walk. We also saw for ourselves the receding water level at the Akosombo Hydroelectric Dam in the Eastern Region, which had caused the shutdown of its turbines, which in turn affected the generation of electricity, causing a shortage and resulting in longer lightsout. 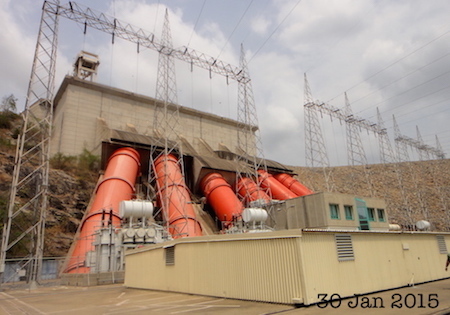 Akosombo Dam is one of the three hydroelectric dams generating electricity for the nation. We travelled to Keta district in the Volta Region and got a little insight into its history of Danish settlement; eager locals also gave us impromptu briefings on Keta’s economic activities of farming and fishing. 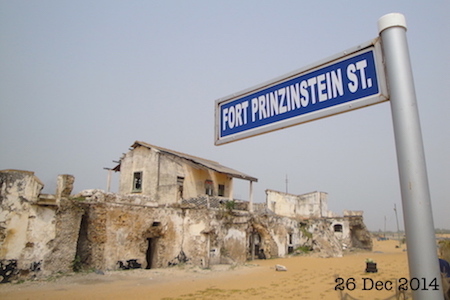 Fort Prinzinstein, built by the Danes in 1874, was a slave post. Little Em looking at Keta’s economic activities of farming and fishing. I was also able to get re-acquainted with my first Ghanaian friend (and his family) whom I met in university in the United Kingdom 19 years ago, when he was home for a visit from London where he is based now. Unfortunately during that dinner at our home, “dumsor” struck and the generator failed us too. 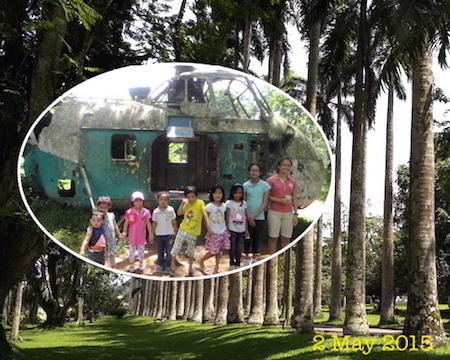 The genset was restored on time to enable us to take some memorable photos. 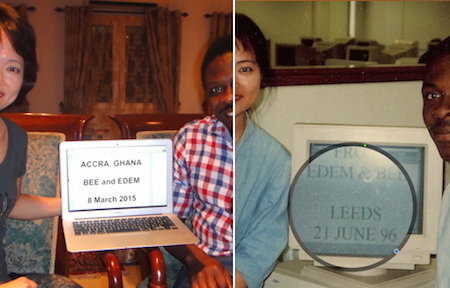 From Leeds, UK to Accra, Ghana… two friends met again after 19 years. 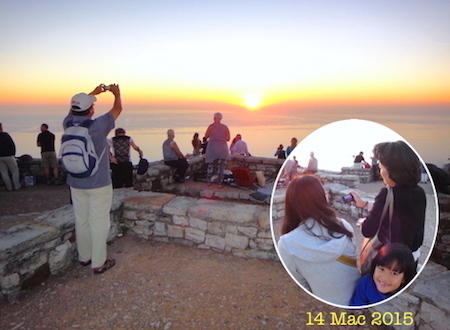 On an even brighter side, we managed a relief break to Cape Town, South Africa. After numerous flight delays from Accra, we arrived in South Africa’s third most populous city. Driving on its well-lit highway from the airport to our hotel – with no bumpy road and no potholes to avoid – and into the city where high-rise sprout from both sides of the road, reminded me of home. Little wonder by daylight the very next morning, it didn’t take much for Little Em to ask, “Can we stay here FOREVER?” Our Cape Town trip will be fondly remembered as “reaching the top of the world and the end of a continent”! 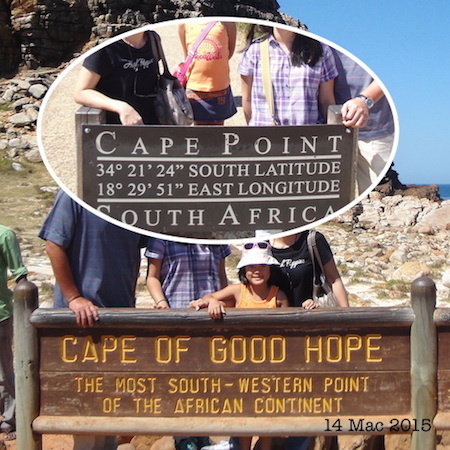 … and reaching Cape Point and Cape of Good Hope, the most south-western point of the African Continent. We’d also gone home – our first trip home since coming to Accra in April 2014 – during the summer break which turned out heartbreaking as we unexpectedly ended up attending Dad’s funeral. 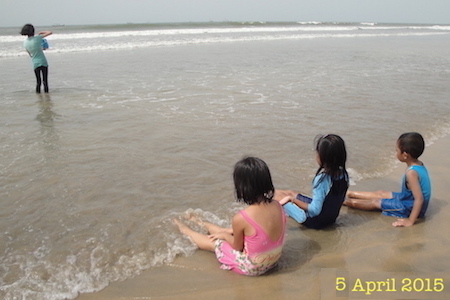 The girls grew a year older here (while I aged five years) and both completed their respective grades. 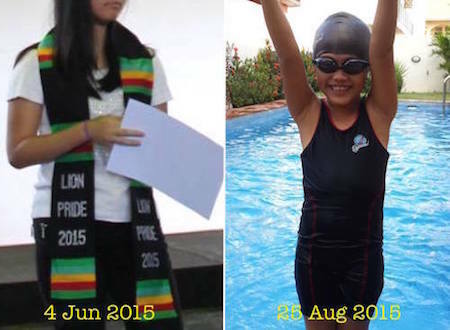 While academically-inclined M was awarded a certificate for her academic achievements, the more outgoing Em made it into the Swim Team, a great achievement nonetheless, considering she couldn’t even swim when we first arrived in Ghana. Big M with her certificate; while Little Em rejoiced in making the swim team. In the past year, I’ve personally made some good friends and enjoyed the diverse and international company of acquaintances; spent lovely mornings, noons and nights in the homes of colleagues from Australia, Canada, Colombia, Germany, India, Japan, Korea, Lebanon, Nigeria, Norway, Sudan, Turkey and the USA; that temporarily took me away from my own home headaches and other problems. 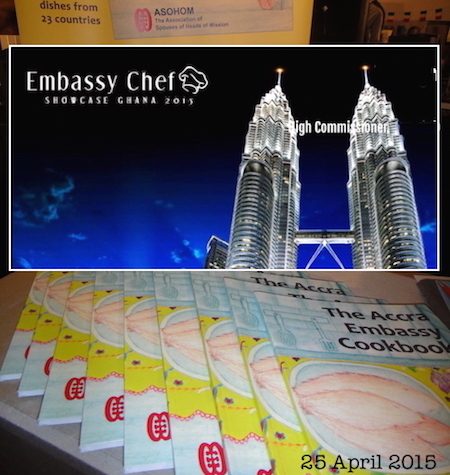 Collectively we published a cookbook, and together we participated in the inaugural Embassy Showcase 2015 Ghana, where we launched the cookbook. As for the official functions, there is a striking difference between our last posting in HK and in Accra. In densely populated and space-lacking HK, official events are primarily held indoors, in air-conditioned hotels (except for the annual flag-raising ceremonies). In Accra where land is generous, and compounds of office and residence are vast and spacious, most of the receptions are held outdoors on the lawns. 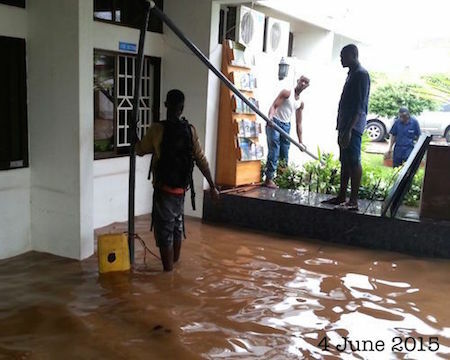 So Accra receptions will be remembered for the trickling sweat, as well as the sinking heels into the soil! 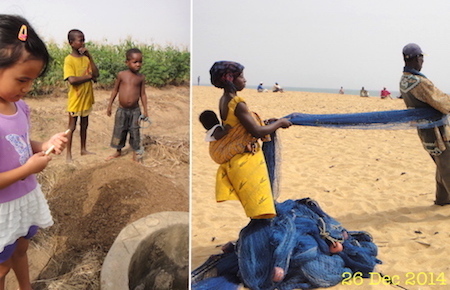 But the kids had enjoyed being outdoors, whether on the beach or in the gardens. Looking out towards the Gulf of Guinea and the larger Atlantic Ocean. 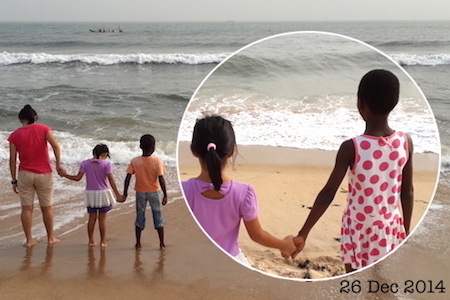 On the beach in Keta, a friendship is forged. 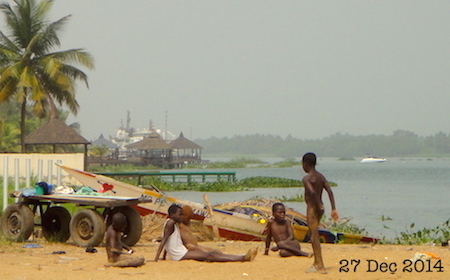 These unclothed kids were “little businessmen” offering us boat rides on the Volta River. 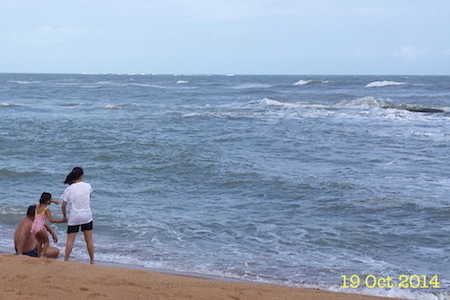 Another Sunday spent on the beach in Kokrobite. A day out in Aburi Botanical Gardens. Not one who enjoys the outdoors, I have to admit I am happiest at home. In the midst of all the troubles and stress, my upright Kawai has been a constant companion, while my old Singer keeps me sane through my hobby of sewing. 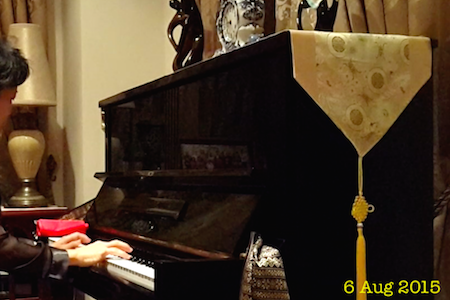 Romancing my Kawai… and Korean drama songs in particular, with current favourite “Love Rain” and still attempting to pick up Dear Cloud’s “Remember”. 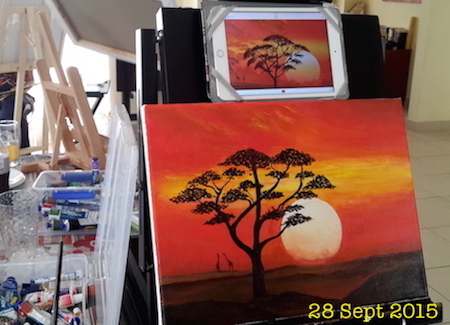 And finally, after one-and-a-half years here, I was finally able to fulfil another passion – painting. 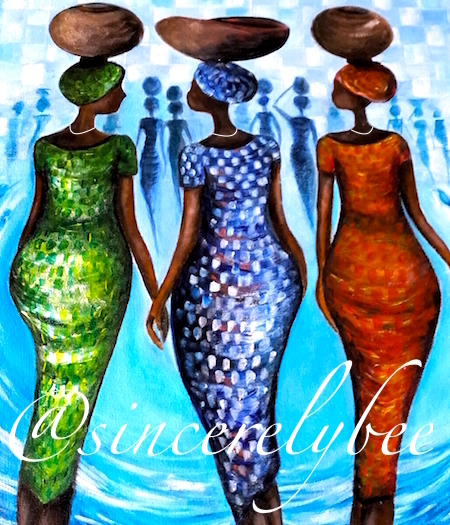 My first piece of completed work, naturally an African landscape. I’ve just gone for the first lesson this week, and enjoyed it tremendously. It reminds me of my many wonderful “Tuesdays with Alexei” in Moscow. I now know I will look back (later) very fondly, especially the memorable “Mondays with Issac” in Accra”! 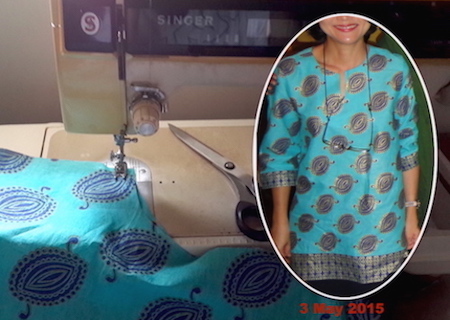 This entry was posted in African Adventures and tagged Accra, Ghana. Bookmark the permalink.